Small suitcases, cabin luggage and travel trolleys, we tested each within its category, looking for pros and cons, coming up with a verdict of our own. Before writing the best suitcase reviews, we gathered feedback from a number of customers, did some additional research on Amazon and around the net, and assigned few of our team members to test each model manually, under a variety of conditions. To save you a ton of legwork, we recommend six distinct models, satisfying a number of your needs while considering a range of price options. From premium end models, with a lifetime warranty, to surprisingly exceptional suitcases on the budget, this is, bar none, the best luggage selection in the UK. The first thing we look for when writing luggage reviews, is of course the shell. The models compared below all feature a hard shell body, with either ABS , PC, polypropylene or polycarbonate material. To put it simply, there is virtually no amount of pressure that can occur under normal circumstances that can crack or significantly damage the body. Some of the models have a flexible top, while others are additionally reinforced so there is no need for extra flexibility. Every model reviewed below features a 4 wheeler base, and depending on the wheel mechanism they include double or single wheel legs. All of them rotate fully, at 360 degrees, which saves a lot of energy during maneuvering. So without further ado, let’s take a look at the in-depth reviews, and make the calculus for each suitcase separately. An affordable lightweight competitor, the Merax lightweight hard shell 4 wheel travel trolley offers a number of features that sit well beyond its price category. With an ABS hard shell protection, that is flexible enough to withstand a tremendous amount of pressure, this model fits every traveling occasion. The design is simple yet elegant, with a palate of colors easily recognizable. The entire surface of the body has a fine texture, which can hide marks and bruises form the eventual wear and tear. Comparing the Merax with other models, it is by far one of the lightest suitcases available on the market. With a storage capacity of approximately 61L, the Merax measures 65 x 44 x 26 cm (all parts included), and 59 x 40 x 26 cm for the body only. The weight is 3.2 Kg, which is fairly light considering the size and storage capacity, as well as security of the shell. The model doesn’t feature anything out of the ordinary, but it is a huge surprise to see the same number of features that a Samsonite model of the same size might have. At a fairly affordable price, this makes the Merax a top of the list competitor. The shell is durable and sturdy, and it is lined with an equally reliable zip mechanism. If you need extra security, the integrated lock will take care of that, saving you some headache. The fixed handles are much more reliable than those of competing models, and the telescopic handle is of very decent quality – all in all, a quality consistency across different feature components, which is not quite expected within this price range. The interior is fully lined, and has enough compartment organization to suit the style of every traveler, organized or less so. The wheel mechanism, although featuring a single wheel system, includes 4 fully rotating (at 360 degrees) wheels. They are secured for extra durability, but won’t compare nicely against those of pricier models. If you avoid rought terrain, they will do the job nonetheless. Quiet and smooth, they are everything I would ask for from a suitcase within this price range. My concern is the long run, since they look like the most vulnerable link within the chain. But all the while we tested the Merax, they haven’t shown any signs of weakness. Probably the best competitor within its category! Extra durable ABS hard shell, with a fine texture covering the body; reliable handles fixed on the side and top, a very smooth telescopic handle that is also height adjustable; locking mechanism that guards the already reliable zip mechanism; quiet and smooth wheels that make maneuvering easy and effortless. The wheels look vulnerable when compared to other models. Though they haven’t shown any sign of weakness even after rough testing. At this price, the Merax lightweight hard shell 4 wheel travel trolley is one of the best suitcase options available on the market. It features every desirable quality you’ll look for in a suitcase, and performs well beyond your expectations. The color, design, texture, and reliability all work together to make this suitcase a modern fortress you are likely to rely on for years on end. Highly recommended! It amazes me just how much convenience and style can be packed into a relatively affordable model. The last decade allowed manufacturing processes to thrive, and the Travelhouse ABS hard shell 4 wheel travel trolley is a perfect example. Super affordable when compared to other models with similar features and characteristics, this suitcase offers everything you’ll need, and does so on a budget. With a flexible ABS shell that can easily withstand pressure and impact, the Travelhouse offers safety and durability. It is, by no means premium quality material, but the texture and design patterns mask this fact pretty well, making the model look quite expensive. The zip mechanism is surprisingly durable, and it offers the option to further expand the storage capacity. A combination lock is embedded on the side, which is a rare thing within this price range. Along with the material of the shell, it will keep your luggage safe no matter what. The telescopic handle is height adjustable, gliding smooth and friction free. What bothers me slightly, though, are the fixed handles. Far more comfortable than any other model within the same category, they seem to be the only weak link of the chain. When fully loaded, I guess, their integrity might suffer, effectively breaking at the sides. Make sure, therefore, to use both of them when lifting heavy, or at least avoid carrying the suitcase by the handle, for minutes on end. The wheel mechanism is great for the price, offering double wheelers that spin at 360 degrees. Maneuvering the Travelhouse, therefore, is very easy even when fully loaded. The interior is offers two large compartments – one at the bottom, with elastic bands to hold your belongings, and another one at the top, featuring a zipped compartment. In between, a smaller compartment is available as well, where you can keep things for easy access. It too, has a zipper. This is, perhaps, one of the most affordable suitcases on the market. Carrying up to 66L, it has the capacity between small and large suitcases. The measurements are 67 x 46.5 x 29.5 cm (with all parts included), whereas the body alone measures 61 x 41.5 x 29.5 cm. The hard ABS shell is super sturdy and flexible enough to withhold high pressure when applied to the top panel. The texture will keep aesthetics unspoiled even after years of use. With zip mechanism, lock, retractable handle and wheels working perfectly, the purchasing decision is a no brainer. While it is hard to find any, I’d say the integrity of the fixed handles. They might suffer after years of use, especially if you are carrying it by the hand, when it is fully loaded. If you need a super affordable yet reliable suitcase, the Travelhouse ABS hard shell 4 wheel travel trolley is highly recommended. We reviewed many models throughout the years, and this one stands out when you look at the average score. It features everything you’ll need from a suitcase, and goes well beyond other competitors within the same price category. Highly recommended! Perhaps one of the few brands that come close to Samsonite in terms of quality, Antler has been on the market for decades. The Juno model, a flagship of the company, can easily compare to the best luggage models ever designed, without putting a hole in your pocket. Elegant as always, the Antler Suitcase Juno 4 Wheel Spinner Large looks compact and stylish. It is designed to be a contemporary luggage solution, while clinging to classic note. The ridges blend nicely, preserving aesthetics while also reinforcing the body. The shell is made of tough and very durable polypropylene, which is several classes above other materials, such as ABS and PC. No matter how much pressure you decide to apply at the top, it simply won’t give in. The texture is another thing you’ll appreciate, since it is easy to clean, and would perfectly mask the casual wear and tear throughout the years. It looks stunning on the outside as well. What I especially love about the Antler Juno is the wheel mechanism which is flawless. With double wheels spinning at 360 degrees, maneuvering the Juno is a real pleasure. Additionally reinforced, the wheel mechanism would allow uninterrupted commute, regardless of the terrain. Unlike the other models mentioned above, with the exception to Samsonite, the Juno can easily handle rough terrain. Regardless of the stress, the wheel mechanism won’t give in. This suitcase model comes with a large and height adjustable telescopic handle, and a very reliable zip mechanism. Both are premium quality, as is any other component found on this model. A TSA combination lock is fixed on the side, and it provides security you can actually rely on. Two fixed handles are included as well, considering the size of the suitcase which is 79 x 31x 53 cm. Storage capacity is 130L, and the total weight of the model is 4.2 Kg. The model features a super durable polypropylene shell that looks elegant yet contemporary. The texture is perfect for one that travels frequently, since it will keep your luggage looking the same even after years of use. The wheel mechanism is well above anything else within this category, and you have a very reliable telescopic handle and a durable zip mechanism. There is TSA combination lock fixed on the side as well. The Juno comes with a 10 year warranty, which covers for the quality, including the handle, wheels, and everything else that might break as a result of a quality issue. Slightly uncomfortable handles on the top and side, considering the size of the suitcase. If you like to enjoy a premium quality product, definitely consider the Antler Juno. It is perfect for the frequent traveler – stylish, durable, and extremely reliable. From zip and handle mechanisms, to strong and smooth wheels, the Antler Juno is designed to provide a frictionless user experience. The price is relatively affordable when compared to its cousin the Samsonite, with whom they share a lot of features and characteristics. Included also, is a 10 year warranty, covering every issue that might arise as a result of a production flaw. If you travel frequently, definitely consider investing in this wonderful suitcase. A true modern statement that looks elegant at the same time, the Vesgantti lightweight hard shell 4 wheel travel trolley is one of the best performing models. It comes with an ABS plus PC material, making the shell flexible and ultra-lightweight. The plastic is reinforced and allows flexibility without the risk of sudden cracks under pressure. We tried applying firm pressure on the top, and it seems reasonably flexible even when the suitcase is completely empty. The exterior measures 35 x 23 x 56 centimeters including the handles and wheels, which is only slightly larger than the Aerolite model reviewed above. The contemporary design makes this Vesgantti model quite appealing. The surface is surprisingly smooth, and the patterns look dashing. Regardless of the color you prefer, the contrast which is provided by the black details is quite attractive. The visual pump of the model is largely thanks to the curvature of the edges, which is another thing that makes the Vesgantti easily maneuverable. The wheel mechanism is not a premium quality set, but it does the job and then some. Gliding is smooth and frictionless, but I won’t recommend rough terrain for a test. Double wheeler, 360 degree mechanism, allows you to push and pull with minimal effort, which is more than one can expect considering the price. To take the focus away from the shell, you have a very reliable and durable zip mechanism. One that is likely to last for years on end. It has a supplementary lock on the side, with a 3 digit combination – much safer than adding a padlock. The telescopic handle is surprisingly smooth, and it can be adjusted to suit your height. In addition, a built in handle is placed on top, so you can lift the suitcase and carry it by hand. To be honest, it provides much more comfort than using the Aerolite model handle mentioned above. The interior is covered with a decent quality fabric, but it is nothing spectacular to say the least. Two zipped compartments are available for the top section, and one small compartment is placed on the side. The bottom is pretty shallow, and you can use the elastic bands to secure your clothes in place. With a capacity of 31L, it provides decent storage. The model is recognized by contemporary yet elegant design. Smooth on the surface, it provides durability and safety. The plastic exterior is flexible, and it cannot crack even under tremendous pressure. The wheel mechanism, zip mechanism and telescopic handle, all work reliably and without any noticeable friction. It has decent storage space and easily maneuverable size, especially when you consider the curved edges. The handle on top is very strong and super comfortable. It is relatively affordable, considering the lifetime warranty. Not the best wheel mechanism out there, and slightly less storage capacity than its competitor, the Aerolite. If you fancy the contemporary design, this model can be the best choice across different categories. All components work reliably, and it seems durable as a whole. The price is affordable, and you get a lifetime warranty ensuring the quality of this Vesgantti model. I especially appreciate the flexible shell, which can easily safe you from buying another suitcase if airport personal handles your luggage roughly. Highly recommended! A flagship model in its class, the Aerolite super lightweight ABS hard shell travel carry on is irreplaceable. Small and compact, it can still fit everything you’ll need. The shell design is very elegant and along with every other component, it creates a uniform concept – a small, compact, yet stunning suitcase that looks fortified and ultra-durable – characteristics that describe not only the visual, but physical aspect of the suitcase as well. The ABS hard shell protection provides unmatched durability within this price category, and comes at a very low cost of weight. The whole suitcase, when empty, measures 2.5 kg. That is surprisingly lightweight, when you consider the 33L capacity, and generously protected outer shell. The body measures 47 x 20 x 34 cm, so it is easily maneuverable. The wheels, though not premium, provide a smooth glide nonetheless. They spin 360 degrees, making each commute easy and hustle free. The retractable handle is smooth and sturdy, and it can be adjusted to fit your height. You’ll receive a 3 digit combination barrel padlock, which adds a bit of extra security when you travel, but do not expect much. What I appreciate more, is the 5 year guarantee which is far longer than any brand cares to provide. You can choose from 5 separate colors, but do note that the dark varieties look far more expensive. The charcoal and wine options are my favorite. This model, first of all, is a work of art. It is small and compact, but the overall design makes it look even more so. The interior provides so much space that you’ll be surprised, and the exterior offers design consistency making the Aerolite extra elegant. The wheel mechanism works supremely well, and the telescopic handle is quite reliable – perhaps the best one within its price category. The body is covered with a dotted texture, so it will look brand new even after years of wear and tear. The 5 year guarantee is without doubt a precedent within this price category, and it can easily skyrocket the price upwards. It surprises me that Aerolite kept the same exact price for quite a while. 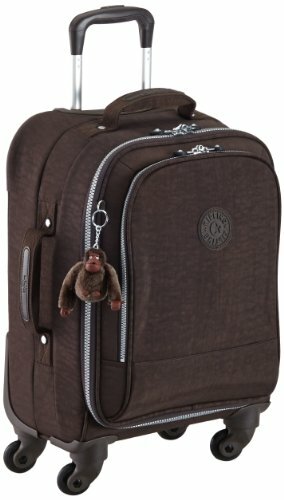 If you shop from Amazon, there is also free UK delivery, which makes this suitcase even more affordable. The top handle is not so comfortable if you plan to lift the suitcase and carry it by hand. Though much of it depends on how much you pack. We were reviewing hundreds of suitcase models for the last couple of years, and it is safe to say that the Aerolite super lightweight ABS hard shell travel carry on has no competition within its class. 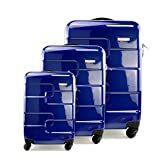 If you are looking for a very easy to maneuver suitcase, that is durable and reliable, there is not a single model that can offer as much as the Aerolite, especially when you consider the ridiculously affordable price. If you need a small and maneuverable suitcase, there is no model better than the Aerolite travel carry on. 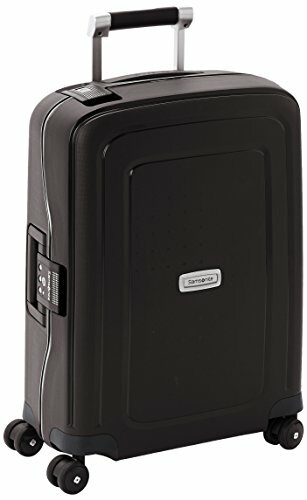 A true fortress of security, the Samsonite Neopulse 75 cm spinner matte black suitcase is surprisingly light and elegant. It is made of polycarbonate, with a self-reinforced design, which allows a very light yet durable shell. Apart from having a stunning design, it features extremely durable components as well. The telescopic handle, zipper, and wheel mechanism all function reliably, even when we made the intent to handle them roughly. The wheel mechanism, by far, is one of the best we have ever tasted. It comes with very strong leg attachments, and double wheels for extra smooth rolling. To maneuver the Neopulse, even when completely full, is something that a 5 year old can do without effort. Much of it is thanks to the premium quality wheel mechanism, but it is a question of design as well. The positioning of the wheels, in relation to the size of the bottom, as well as weight and height of the suitcase, creates a good center of gravity, and very balanced weight distribution. The double tube handle is very smooth as well, and it is adjustable according to height. The button functions as expected without any friction whatsoever. All the other features, it seems, create such consistency. To have a product so nicely designed, so reliable, and so frictionless, is a real privilege. One that you’ll have to buy for a price that is well above the average. But comparing it to other models would be analyzing apples against oranges. The interior of the Neopulse honors the impression you get from the exterior components. It is covered with a premium quality fabric, featuring several handy compartments. The bottom compartment has a lined divider pad with cross ribbons, and the top compartment is quite spacious which I definitely appreciate. High-end quality polycarbonate shell that is super durable yet surprisingly lightweight. The design is captivating and it grabs your attention right away – elegant yet contemporary, it is easily recognizable. A lock mechanism is included, making sure that your suitcase is a fortress of safety. The Neopulse has the smoothest glide you’ll ever experience with a suitcase, thanks to the premium quality double wheel mechanism, and attention to detail when it comes to product design. Every component fits into this consistency of design narrative, providing you with features that work as intended. Reliable and frictionless, you’ll enjoy using it for years to come. Not a single one we were able to think of. What bothers me slightly though, is the price, which is well above your average suitcase. However, this one is not your average suitcase. 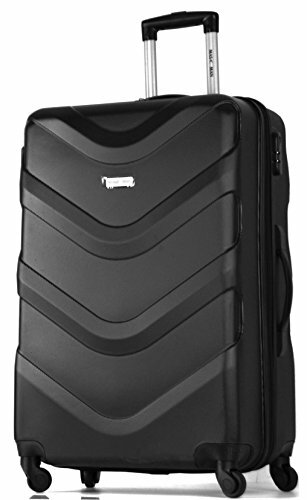 If you are interested in having one of the best models available on the market, the Samsonite Neopulse 75 cm Spinner is definitely worth considering. It is the perfect suitcase for the modern traveler – one that dwarfs almost every other model in comparison. If you travel frequently, or simply enjoy using the suitcase fully and without any friction, then definitely invest in buying the Neopulse. It is, bar none, the most elegant, reliable and durable model on the market.